I got the Citi Prestige® Card this week. (Here’s why I got the Citi Prestige.) It makes two of the other cards I have less valuable. The Citi ThankYou® Premier Card is flipping its category bonuses on April 19 to nearly mirror the category bonuses I’ll have with the Citi Prestige® Card. I only need one card that earns 3x on flights and hotels and 2x on travel and dining, and the Prestige is fine for that. The Citi® / AAdvantage® Executive World Elite™ MasterCard® comes with Admirals Club membership. 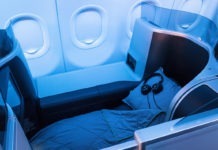 The Citi Prestige® Card comes with access to Admirals Club for me plus two guests (or a spouse and all kids) when flying American Airlines or US Airways and access to Priority Pass lounges worldwide. I only need one card for lounge access, and the Prestige is better. For that reason, I decided to call Citi and ask about canceling my Citi ThankYou® Premier Card and Citi® / AAdvantage® Executive World Elite™ MasterCard® to see what retention bonuses they’d offer. A $125 statement credit if I spend $3,000 in the next three months. A $125 statement credit and 1,000 bonus ThankYou Points if I spend $1,000 per month for the next three billing cycles. If you’re only given one offer, ask if there are any others. Sometimes not all offers are given so easily, and offers vary by account. I asked him to put the second offer on my account. I wasn’t planning to cancel this card, and this is a nice bonus that works perfectly for me. I am already in the middle of spending $3,000 by mid-May because the card has a split sign up bonus, and I am in the first three months of my second year of being a cardmember. 1,000 bonus American Airlines miles every billing cycle that I spend at least $1,000 for the next 16 billing cycles. That’s up to 16,000 bonus miles. 2 Admirals passes every billing cycle that I spend at least $1,000 for the next 16 billing cycles. That’s up to 32 Admirals Club passes. I must have misunderstood this offer because I can’t believe 32 passes are being offered. I also don’t see much value since the card offers free entry into Admirals Clubs automatically. I asked for the first offer to be applied to my account. That’s 2 miles per dollar on all purchases on the card as long as you spend just over $1,000 per month. I’m not sure I’ll use the card enough to earn the bonus, but in case, I don’t want to miss out. In the end, I didn’t cancel either card. I will probably call back in June to cancel my Citi® / AAdvantage® Executive World Elite™ MasterCard® before its $450 annual fee is due. After all, I have a Citi Prestige® Card, which offers me Admirals Club access. If you’re thinking of canceling a card, call in to see what offers you get to keep it, regardless of the issuer of the card. You don’t need to wait until an annual fee is due. If you have the Citi ThankYou® Premier Card, you may get extra bonus miles and a statement credit while you’re unlocking the second part of the card’s sign up bonus like I was offered. Hi Scott, I have a question if u don’t mind.. I need a one way ticket for 3 people from CDG to IAH on Sunday April 26th using American Airlines miles, I keep looking at the AA.com website but there’s never an availability on that day for saver award option, only 65000 tickets are available (the date is fixed unfortunately). I am not sure if I can use the AA miles at the saver level (20000) per person on partner airlines, would that be possible? Or would it cost more on the partner airlines? Any suggestions are very appreciated. Just spent few minutes trying to do this (had some time today), and hope it is somewhat helpful. I could not find availability from CDG on 04/26, but found availability from Madrid on that date for 3 people in Economy. Flight details below. I am unsure of the MCT at MAD airport, but if it is 1 hour or less and if Iberia opens up economy space on IB3401 for 04/26 later, you can change your AA award reservation without any fees so that your layover in MAD reduces from 12 hours to 1 hour. Would you recommend doing this even if you’re not really cancelling a particular card, just to see what is offered? I did basically the same thing a couple of weeks ago with the prestige and exec card. my prestige fee is only 350 since I am already citigold. the retention offer which I did not accept was a statement credit of 250. The retention offer that I received on my Exec card was $450 statement credit after 3 months of $5000 spend. Works for me because I am planning on spending 40k for the 10k status miles anyway. I guess it all depends on the account.